Season 1 - Episode 10: "The Phantom Zone"
Going into SyFy's Krypton I was a little skeptical. I love origin stories and I love prequels (hence my love for Man of Steel and Smallville), but recently DC has been releasing a lot of content that is very hit-or-miss (I loved Supergirl Season 1, but I could not stand Season 2, aside from the Superman episodes). I'm happy to say that Krypton Season 1 has been a hit, largely because it stays true to the sci-fi genre, giving it an almost Battlestar Galactica feel, while still retaining elements of the comic book/superhero genre as well. This week's finale was crazy, I'm not even sure where to start, but I'll start with Seg-El. Seg-El has been on the "hero's journey" this season. He's aware that his son Jor-El and grandson Superman are heroes in their time, and because of that he's been conflicted, trying to figure out who he is in relation to the rest of the House of El. I loved the scene in the climax of the episode where Seg and Val-El have conceived a trap to send Brainiac to the Phantom Zone. It works, which is amazing, but at a cost. Seg is grabbed by one of Brainiac's tentacles and pulled into the Zone with him, but not before he sees Superman's cape completely restored, thus recognizing his place in the House of El and truly becoming a self-sacrificing hero. After a whole season of Seg trying to restore his family's honor and defeat Brainiac, this was a wonderful pay-off. It doesn't stop there, however. Once Seg is gone, Superman's "S" transforms into the emblem of the House of Zod. We fast-forward to a month later where we see that General Dru-Zod is now the leader of Kandor, with both Dev-Em (with a new robotic arm) and his mother Lyta-Zod by his side. This was an interesting twist that truly changes Kryptonian history. No matter what Seg, Adam, and the rest of the crew do next season to de-throne Zod, he will always be a part of Kryptonian history, before he's even born. Obviously, this was always Zod's plan, from even before he decided to give up Val-El and the Fortress to Brainiac, which is the reason Adam came back to Krypton in the first place, but now that we see it, it seems almost surreal. Speaking of Val-El, it's revealed that he's been alive and in the Phantom Zone since his "execution" fourteen years ago. This came as a surprise since AI Val-El has been such an integral part of this season, I would have figured that he would have brought up the Phantom Zone solution as opposed to Zod or the real Val. After I watched the finale, I listened to an interview with showrunner Cameron Welsh on the Starkville's House of El Podcast where Welsh talks about Val-El having to deal with his time in the Phantom Zone in Season 2, which I think is an interesting way to develop him next season as opposed to Val simply being an artificial intelligence. Nyssa-Vex was revealed to be a clone of the original Nyssa-Vex this week, which was honestly a shock. I've said it before and I'll say it again, Nyssa is definitely the most interesting character on Krypton. Originally, I thought Adam Strange was transported to Metropolis, especially since it was revealed that the city was in one of Brainiac's bottles and had a giant statue of General Zod (seemingly replacing Superman's "Heroes Park" statue), but from listening to that interview with Walsh, he says that Adam is back in Detroit, which makes me really wonder what the timeline now looks like. Did Zod take over all of Earth and (a future) Brainiac later invaded? I have no idea, but I can't wait to find out! We have no idea what Daron-Vex or Jayna-Zod's fates are as of this episode, so hopefully more on them next season! Jax-Ur, Nyssa-Vex, and Val-El all in the Fortress at the end leads me to believe that the Fortress may become the new base of operations for Black Zero as they attempt to overthrow General Zod. Also, Lyta and Dev do not look particularly happy with Zod's reign, so I'm excited to see more on that later. Lastly, the cinematography on this episode was gorgeous. 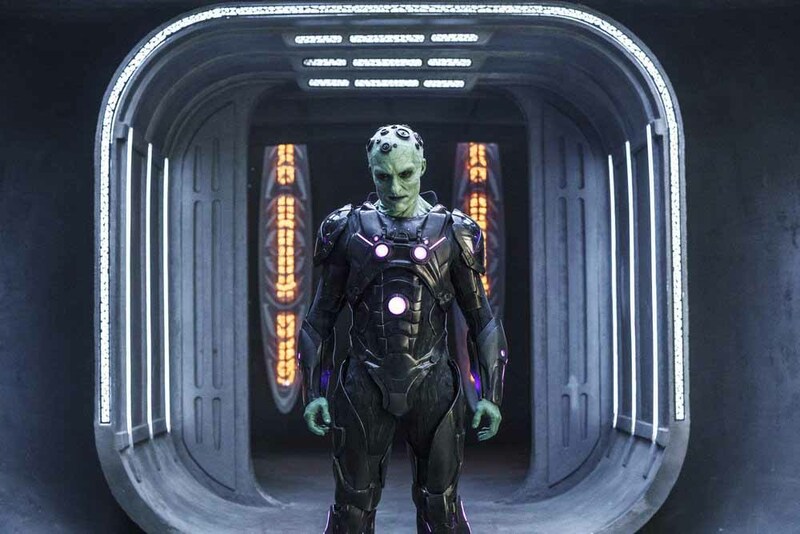 The shots of Brainiac's skull ship descending upon Kandor honestly looked like something out of a feature film (as did Brainiac truth be told, I kind of hope we see more of him next season too). This makes me hope even more for a Man of Steel 2 with Brainiac as the villain. How amazing would that be? Anyway, enough about that. Krypton has been an amazing ride and I'm truly excited for Season 2. Until then!